Architecture is a living being – it reflects the culture and mood of the times. We are not static beings and so our buildings are renovated and change over time. The renovations and changes to buildings relate to the current fashions, same as how the fashions change for the clothes we wear. Given that good architects spend a lot of time trying to design attractive and proportioned buildings, should we not consider it important to do the same when we get dressed each day? He discovered that we find this ratio beautiful. Interestingly I know a cosmetic dentist who uses this ratio to determine the size of each tooth in relation to itself (height and width) and also the tooth next door. Given that we find things that use this ratio so aesthetically pleasing (fern fronds, snail shells, snow flakes) it has also been found that when we dress in this ratio we are also more fabulous. You can use the ratios 1:2, 2:3 and 3:5 particularly when dressing – given that the human body is around 8 head lengths – breaking your body up with these proportions creates a beautiful balance. Thus, always look for clothes that are uneven in proportion to each other – so rather than two boxy items (1:1 ratio) look for a long and a shorter garment to put together. You can see just by the simple change of top to one that is longer and has a collar, we are taking away the boxiness of this outfit to create a more balanced appearance. 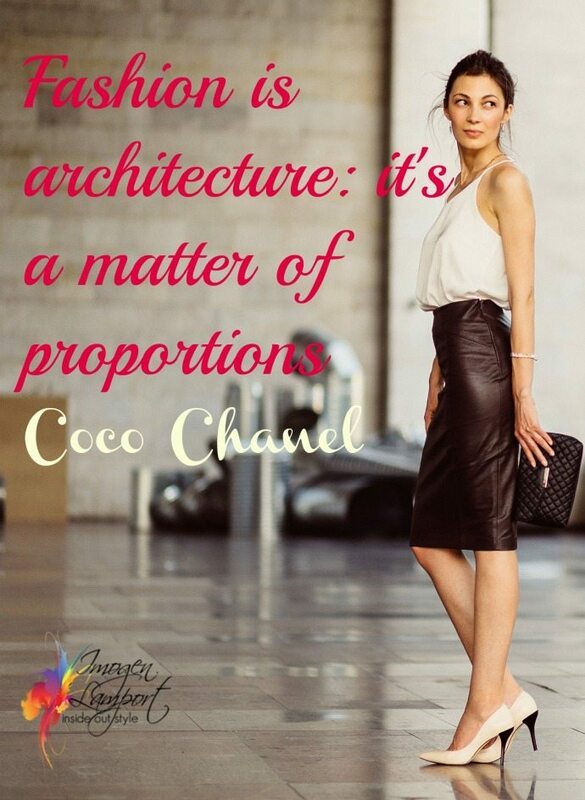 Do you ever think about balance and proportions when choosing clothes? Next articleWhy are Accessories so Scary? Wow Imogen, this gets even better. Yes, yes, this is how I actually think with my own projects too. I have just forgotten myself on the way. I´d just like to add to all this, that just a bit of the unexpected, something the viewer can her/himself fill in, will make the picture perfect, yes ? Metscan – adding your individuality to an outfit is paramount – it's what makes you – you, and your clothes really work. Thanks Imogen. We are speaking the same language :)! That's not nearly as elegant as explaining it with Fibonacci Numbers! Glad you're finding some useful information here! Just a small addition, if I may. I Iike a painting that is left just a bit unfinished, I leave a room I´ve decorated the same way. Now, when someone else looks at either one of these, she/he can think hmm. interesting, and in her/his imagination finish the painting or the room. I suppose the same goes ( at least I feel so ) in choosing your outfit. I don´t want to have everything s o perfect, I leave something out. If I wear a lot of eye makeup, I go easy with my lipstick, etc. 😉 ! Metscan – interesting – I'd call that about balance – not overdoing it – a heavy eye needs a light lip otherwise it looks overdone. I think that like any art, what you leave out is as important as what you put in. Wow,I just love your blog. It goes beyond fashion. Lately thanks to you I've been taking more notice about proportions when buying and dressing. Before I felt like somethings worked and others didn't but didn't know why. Definitely! Proportion is often foremost in my mind when selecting an outfit. I think that understanding this principle is a key to always looking fabulous. Thank you so much for the reminder and for illustrating it so insightfully. wow that is a great way to consider it!!! I do think about proportions(although not so mathematically, more in terms of perceived balance), but I've never seen the concept illustrated to effectively — just the contrast between those two simple combinations really brings the principle to life! The Golden Mean makes sense when looking at proportion, but I don't understand what the Fibonacci series has to do with it. I understand that they're mathematically related, but how are you using the Fibonacci series in this case? It seems like it's more focused on the Golden Mean. Which is a great idea, anyways. I am always fighting with proportion and this is a nice clear example you've shown. OMG this is genius. I just love using high level theory to explicate the implementation of every day life solutions. Also I love big words:). Evidently. I'm a mathematician who reads your blog so I'm answering Anne's question. The golden ratio is approximately 1.618 to 1. The ratios of successive Fibonnaci series values approaches this value as you progress in the series – in mathematics it's called convergence. and so on. It gets closer and closer to 1.618 as you go up. There's a good wikipedia entry on the golden ratio and you can see how it's found in nature, and on our bodies. What amazes me is that when my husband mentions this concept to the lady architects in his office, they've never considered the connection between this well-known concept and how to dress. ??? Funny, I'm just writing a post and used this principle. It is so universal. Oh my goodness, you just totally lost me. What are all those numbers, what on earth do they mean, and how do they apply to my body and outfits? Sorry, I'm not an architect. This post is brilliant! I can look at an outfit and instinctively see that something's off in the proportion (as in where to belt a dress), but now I understand why. Thank you, Imogen! As someone commented earlier, you are beyond fashion. I love how you break down all the individual elements of dressing with style and enlighten us as to why certain things work and how to make it come together better. OMG the Fibonaci ratio! A whole new way to obsess over not making the grade!!! I never though about fibonacci in terms of flattering clothes, but it makes sense that a 1 to 1 proportion would result in a boxy look. Wow I love how this has brought so many out of the woodowork – thanks for your comments. Thanks for the mathematical explanation rb – you do it much better than me. I also love how my readers like some of the less fashiony and more complicated ideas. What a fantadtic post. W used the Fib formula to write some poems recently. Yes I do, and this is the unconscious reasoning behind the fact that I can never find a top to go with my long skirts. It's because I'm short and shouldn't be wearing the damn things anyway. Jane – interested to know how you write a poem with it! Violet – sometimes you either shorten your skirts or decide to be unbalanced. I'm quite familiar with the Fibonacci sequence as it applies to art but I've never seen it applied to clothing. How clever! Well done! I really enjoyed this post. Imogen- I still really don't understand this, and the pictures aren't coming up on my laptop. Can you explain this in layman terms? When you say 1:1 is boxy, I just don't get it. 1.) I'm built like Jennifer Hudson…should I emulate her style, or would you change some things about the way she dresses her body? 2.) What boots are best for women with big calves (I'm 5'4, very curvy) and would wear them with skirts just below the knee. 4.) 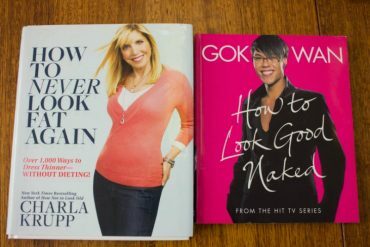 I watch "What Not To Wear"…in your opinion, is their fashion advice good and something I should follow? Thank you so much, I love your site and appreciate all of your tips!!! OOh Imogen, I bet you're glad that RB stepped in to answer Annes question! As an architect I know the golden mean well. Nothing drives me more crazy than when a builder changes the proportions of window during the build and ruins the balance of a facade or space! Sorry, went off on a personal rant there. I think your comment the other day about photographing yourself in the outfit will help people with this. Its easier to take an object eye over a photo to see where the balance fails or succeeds. Anon – 1:1 is two even proportions – so if you think about a top and a skirt being around the same length, it will give a more boxy appearance. Anon – 1: If you like how she dresses then dress like that – dress is not only about shape, but also proportions, body variations and elements such as scale, texture and pattern. Your personality should also be reflected in your clothing – and if her style is not 'you' then even though your body is similar in shape, don't choose the same kinds of clothing. 2; Knee-high boots are great – they slim your calf. Try http://www.duoboots.com for a range of calf widths. 3. I don't recommend ankle length skirts – or average or petite women. 4. US or UK edition? From my watching of all style TV shows is that some of the information is good, but I don't agree with it all – it has to be very simplified for TV. Cybill – never knew you were an architect! That's fascinating! 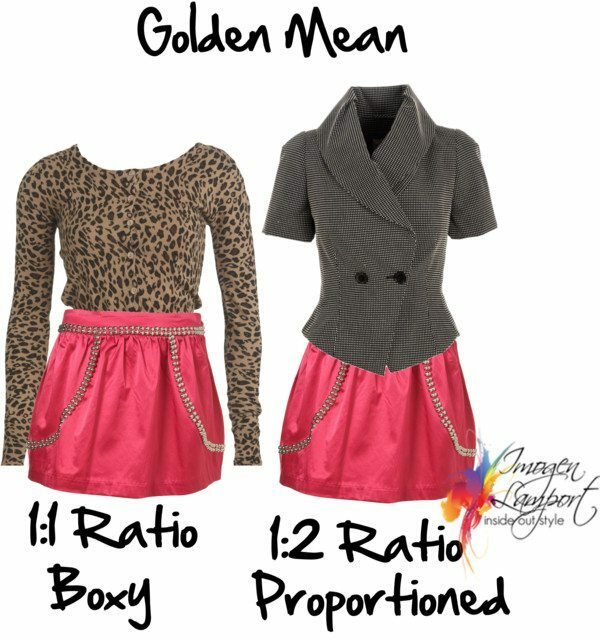 How would you apply the "golden mean" principle to longer pieces of clothing, such as tops to wear with pants? Or what about with a person whose body does not fit into the proportional model that we find most aesthetically "ideal?" Thank you, Imogen, for your answers! I found your blog just last week, and I have learned so much already that I just had to post a comment, even though I rarely comment on blogs. This post (in combination with your wonderful "Body Proportions Explained" post that you linked to in this post) really crystallized a lot of what I have been reading about proportion, and why it's so important for those of us whose natural proportions aren't anywhere close to the ideal. Those posts prompted me to measure each of segment of my body to see where I am short or long. I always knew I had a long torso, but after measuring, I see that the top half of my body to the leg break is a full 4" longer than the bottom half. 40% of my body length is from the navel up, and I am especially short in the thighs (and yes, that is where I tend to hold weight). I am an X shape. By working w/ the measurements for these segments, I was able to work out where the waist of a garment should hit me (or where to wear a belt over a top) to create a better proportion. For me, that works out to approx. 2" above my navel. One of my favorite new summer tops happens to be narrowest at exactly that spot and now I understand why it makes me feel so pretty. You also helped me understand why I feel best in skirts that hit just above the knee and with a higher waist. My calves are proportional, even a little long, but my thighs are very short, so a skirt that fits me well and hits my legs just above the knee and hits my waist at the right spot makes my thighs appear to "match" my calves in length and shortens my torso at the same time. It also explains the magic of heels in more mathematical terms, too. Thank goodness they now make more cute heels that are actually comfortable, because they make such a difference. Thanks so much. I think I'm finally starting to "get" this. My twelve year old daughter told me the other day that my outfit was not well proportioned. I didn't even know she knew the word or concept. She was factoring in my HAIR–which is quite voluminous and smaller now that I've had it cut. I do think about proportion every day. Hi I decided that I am a cross between an Inverted triangle and an H shape body type. A while back I bought a dress with a dropped waistline. Black on top and plaid A-line skirt bottom. I never felt I quite looked okay in this dress. Well when I look at it now I realize that it actually cut me into two equal parts. If I had hemmed the dress or taken the hem out and made it longer or shorter it would have worked. I passed the dress onto charity but now at least I understand why it didnt work. if I could figure out how to upload it I would send you the picture. Adrienne – how great that you’ve figured out now why your dress didn’t work – at least you’ll be able to make the right alterations to any other garments that you have figured out don’t work for you proportionally! How exact does each proportion have to be? For example, would 18 inches (top) to 12 inches (skirt) be okay, even though an exact 1/3 would be 10 inches? I hope that made sense. I’m an X shape and fine that tops look best when they end at the hip bone, but I’m also petite and find that mid-thigh length skirts look best on me. I’ve never measured – but I don’t personally think you have to get obsessed with exact measurements as you have to deal with your not completely proportional body and work with what works best for it.